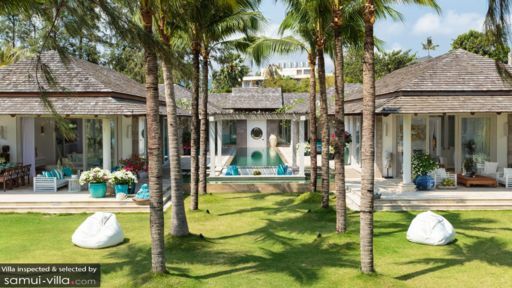 With an ideal location right on Chaweng beach, close to all the happening spots in the vicinity including shops, restaurants, café, and nightclubs, Villa Mia is a five-bedroom, luxuriously-designed holiday home for the quintessential tropical adventure. It is close to the beach which can be observed straight from the villa and can be enjoyed within walkable distance. 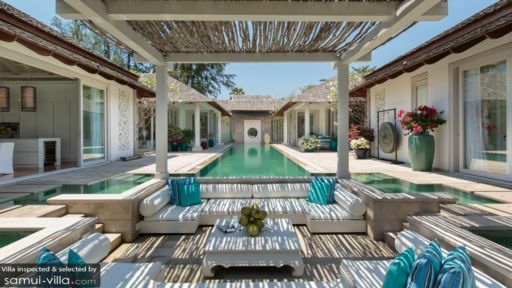 Stunning contemporary structures marked by reworked traditional Asian interiors featuring hues of white and aquamarine are found across the property for a soothing and meditative ambiance. A stunning, poolside master bedroom with elegant interiors featuring a similar white pattern, a luxurious, king-sized bed, a private living area and a writing desk is the perfect setting for a comfortable stay. Each of the five, air-conditioned bedrooms at Villa Mia Chaweng is uniquely designed with Asian-inspired décor and modern comforts. There are several Thai and other Asian artefacts in the bedrooms, massive wall mirrors, and direct access to the gardens and pool for your convenience. Each bedroom has its own en-suite bathroom with soaking bathtubs and dual basins. 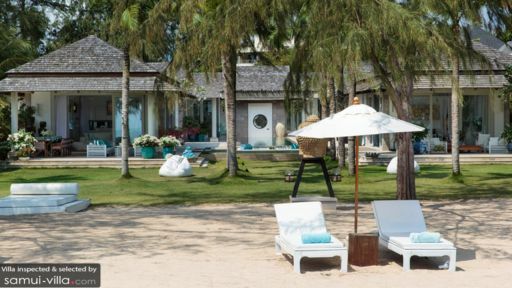 The outdoors is marked by expansive, manicured lawns fringed by rows of towering palm trees, lush vegetation, and the clear blue skies with the sea sparkling in the horizon. The mesmerizing exteriors are made significantly richer with a 23-metre swimming pool which also houses a sitting pavilion with a pergola roof right in the center. The pavilion is bordered by the pool and features comfy sofas and a table where you can lounge, have drinks or take a nap. The pool and sitting light up magnificently once the sun sets and you can truly enjoy the enchanting setting with loved ones. The porch comprises another seating with white furniture and elegant cushions overlooking the sea and the tropical gardens. You will find bean bag chairs on the gardens as well, where kids can rest up after playing around on the grounds. Another porch contains more seating as well as alfresco dining for all the guests. A Jacuzzi and a massage pavilion are ready for indulgence and a relaxing time. The poolside living and dining room is housed in a traditional pavilion with a high-vaulted ceiling painted entirely white. There are comfortable sofas, floor sitting, jute rugs and décor as well as armchairs for the comfort of guests of the villa. Vibrant décor marks the corners of the living area and the retractable glass doors create ample space and provide easy access to the swimming pool outdoors. A large, flat-screen TV is perfect viewing movies, etc. with your friends and family. Behind the sitting area, you will find the expansive, white dining table with a ten-seater dining table overlooking the panoramic views. The modern kitchen is where all the magic happens as the house chef cooks some delectable delights to tickle your taste buds. The kind and friendly staff at Villa Mia will look after all your needs and cater to all of your requirements. They will take care of the housekeeping and maintenance of the villa and even make arrangements for any special requests that you may have. A private gym is at your disposal for your fitness needs. There are ample things to do around Chaweng, after you are done lounging and having a good time at the beach itself. Restaurants and cafes like Magnolia and [email protected] are great places to hangout or you can try Eranda Herbal Spa for a meditative and rejuvenating experience. You can attempt to advance your culinary expertise at Spice Spoons cooking classes! A beautiful house with fantastic staff who serviced our every need. Photos on the internet did not do it justice!! We could not believe our eyes when we walked in. Could happily accommodate up to 5 couples or as with us a family of 6, we were very spoilt. The chef prepared an amazing range of Thai meals for us each night and we all salivated waiting for the surprise deserts. All in all fantastic value for money compared to staying at a resort - highly recommended.